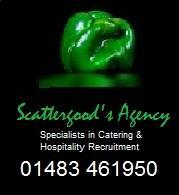 Scattergood's Agency Ltd was established in 1975 as a specialist catering and hospitality recruitment agency. Based near Guildford in Surrey, we are the largest independent catering employment agency in the south east. We supply staff to fill all levels of temporary and permanent hospitality jobs. Whether you are looking for pastry chef jobs or filling waitress jobs, we can help. We provide all levels of chefs, kitchen assistants and waiting staff to a wide range of clients, from... Read more hotels and fine dining restaurants to golf clubs, event caterers and office canteens. As a family business, we aim to build strong relationships with both clients and candidates. We work in partnership to ensure that we can make the best matches between applicants and vacancies. 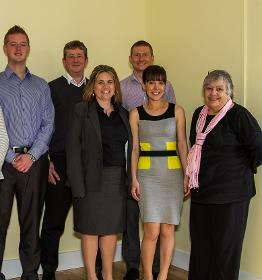 All of our team of consultants have previously worked in front of house or catering jobs. This means we have an in-depth knowledge of the specific requirements of each vacancy and can provide an informed, professional experience. We are always looking for temporary job seekers in Hampshire, Surrey, Berkshire, Middlesex and West Sussex. Our permanent recruitment division covers all of the South East of England and London.